Over 400 had gathered at Place Émilie Gamelin Wednesday evening after a day of strikes and protest actions by Quebec’s major public sector unions and community organizations. 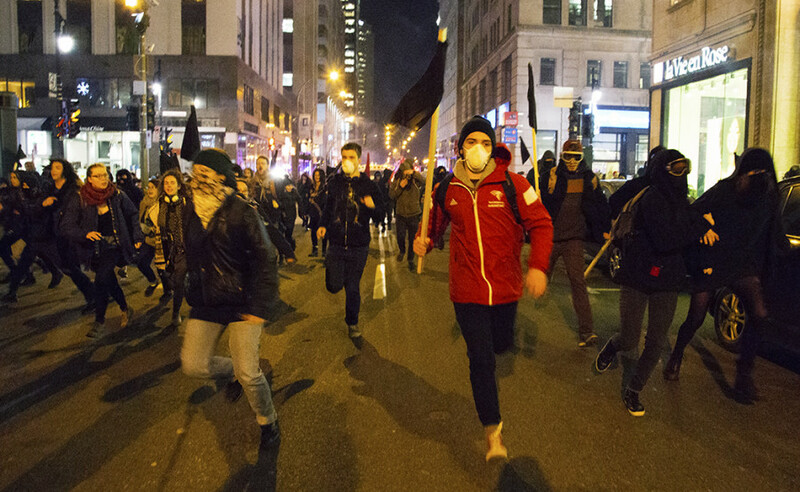 The march began at 8:30 p.m. and headed west on de Maisonneuve Blvd. but was quickly stopped from proceeding further downtown by about two dozen riot police. Undeterred, the crowd sprinted towards René-Lévesque Blvd. 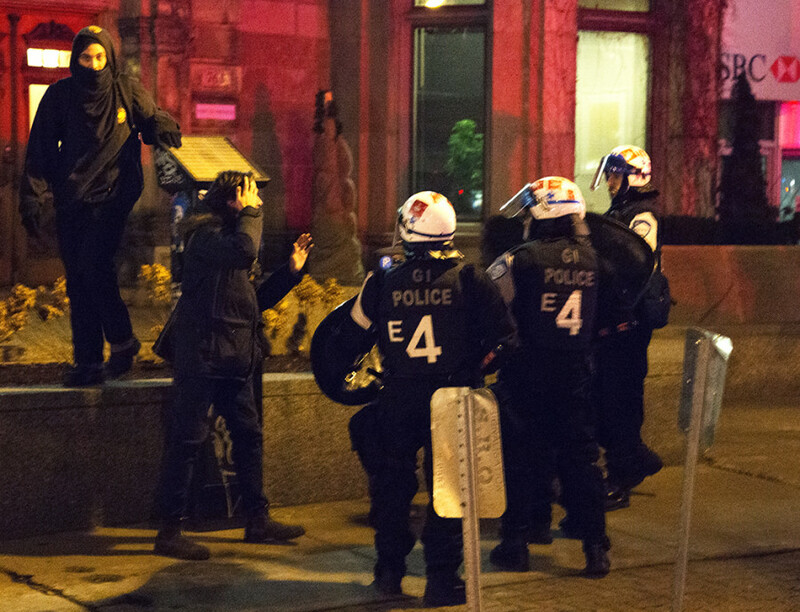 The police, tasked with preventing the protesters from penetrating the downtown core, lobbed tear gas from behind the mass, but the crowd was too fast and most shots fell short. Frightened, yet curious onlookers ran into nearby shops to avoid the gas which filled the streets in the low winter wind. Anti-capitalist chants echoed between the skyscrapers as the protest travelled westward on René-Lévesque Blvd. The police, unable to position themselves in front of the advancing mass, trailed behind and shot round after round of tear gas. The protesters cheered and ran away from the gas into the fresh air. 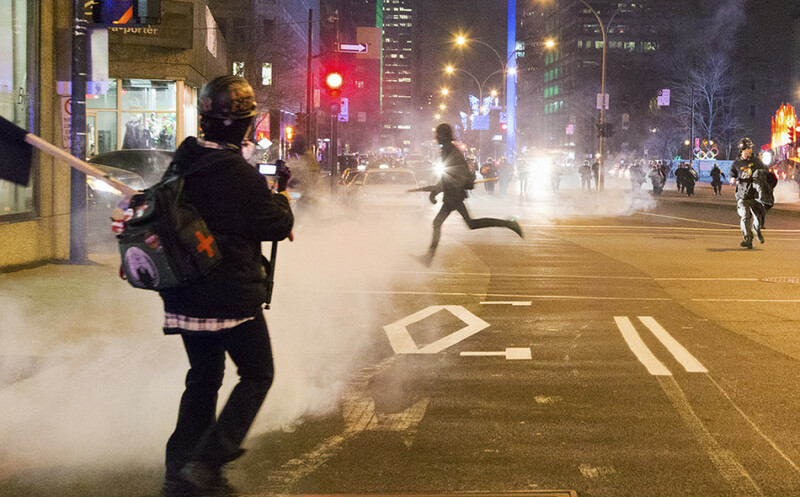 Following another round that fell short of the crowd, a masked protester shot a single large firework into the night sky, exploding in a red and green sparks above the animated group. Along the route, masked protesters shattered several bank windows using rocks and wooden sticks. The windows of police cars and those of the SNC-Lavalin building were also reportedly damaged. 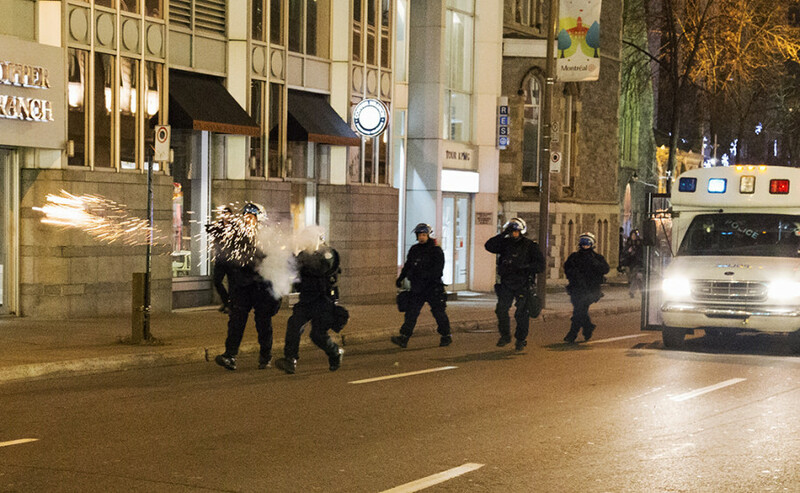 Once the crowd arrived at Robert-Bourassa Blvd., the steady rounds of tear gas became more accurate and effective. The group raced north toward Ste. Catherine St. as a line of riot police sprinted close behind. The protesters who fell short were hit by batons or shoved by riot police shields. Bystanders were also caught up in the violence, with some showing visible signs of distress due to tear gas inhalation. Others, such as David Waddington—an associate professor at Concordia University—were beaten by police. By the time the protest reached de Maisonneuve Blvd. again, many of the protesters had dispersed into the surrounding streets. The remaining few who yelled chants towards the police were charged, and by 9:30 p.m. the crowd had mostly dispersed. Police arrested a 16-year-old for obstructing justice. One person was reportedly injured.